How to plan your team's capacity (availability) accounting for vacations & holidays? This article will present step by step instructions on how to use the Team Vacation Planner Excel template. Before using the template, it is recommended that you are familiar with Excel tables. I have put together a brief article and video about how to use Excel tables for data entry. Please read this if you are new to Excel tables. Assuming you know how to enter data in Excel tables, let’s move forward to the overview of steps. View Report to see summary of understaffed days by month. In the example above, we have entered Jan 1st to Oct 15th as Planning period. For example, in a company that provides Customer Service 7 days a week, more customers may be calling in during Saturday/Sunday compared to other weekdays. In such a scenario, we need more employees at work during Saturday/Sunday. If we enter 0 as Employees Needed, then the template assumes that as weekend day. In the above image, Saturday and Sunday will be considered as Weekends (for reporting purpose). During weekends, employees will not be available to work. Next, we enter a list of holidays in our company. Holidays are days when company does not operate. Hence, Employees Needed will be automatically set to 0. Similarly, employees will also be set as unavailable. We can enter any number of days as holidays. We enter the information about employees in the Employees table. As this template is designed to be used for long planning periods, we know that new employees may join and current employees may leave midway. Also, if you have contract employees, these situations are more likely. Instead of using a new file to change available employees, you can just update the hire date and termination date where applicable, in the same file. The template will use this information and calculate available capacity automatically. We can also handle varying work schedules of employees. For example, Employee 2 and Employee 4 do not work on Saturdays , but other employees do. We can just enter No for any weekday an employee doesn’t work. In the Vacations sheet, we enter the vacation planned by employees. This is very simple. Enter Employee name, Vacation Start and Vacation End dates. If an employee takes only one day off, please enter same date as Start and End dates. Please do not leave the End date empty. As the employees takes more vacation, just add new rows to this table. There is no limit to how many vacations can be entered. This completes our data entry steps. The Calendar sheet is fully automated. At the top of the sheet, we see the Availability Summary. Employees Needed: This shows how many employees are needed at work on that day. If the day is a holiday, then this will be set to 0. Employees Available: This reflects how many employees are available to work on the day. If the day is a holiday, this will be set to 0. If the day is a weekend, this will be set to 0. It will take into account, the Employees’ hire statuses, Employees’ work schedules on that weekday and vacations planned by employees . Employees on Vacation: This is how many employees who are employed on that day, but have taken a vacation. If it is a holiday, this will be set to 0. Otherwise, this will reflect the count of employees who have planned vacations for that day. Availability – Needed: This tells us whether we are understaffed or overstaffed or right-staffed. This is just the difference between Employees Available and Employees Needed. If it is negative, we are understaffed (availability is less than need). If it is positive, we are overstaffed (availability is greater than need). If it is 0, we have the right number of staff (availability equals need). We can also create a similar flag for over-staffing if needed. We have to edit the conditional formatting rules to do that. By knowing which days are understaffed or overstaffed, we can take actions accordingly. If we are understaffed, we can either increase capacity by hiring more permanent or temporary employees. We can also see each employee’s availability on the calendar. This calendar is set up to handle 50 employees for 366 days. Here are some ways to extend the template and customize further. How to extend the calendar for more than 50 employees? The template is designed to handle data for 50 employees by default. The Calendar sheet displays up to 50 employees. If you need for more than 50 employees, it is very easy to extend. Let’s say we want to extend to 55 employees. Unprotect the Calendar sheet with indzara as password. Select rows 59 to 63. Right Click and choose ‘Copy’. You should now see the employees extended to 55. How to edit the red flag in the Calendar? We see a red flag when there is understaffing. We don’t have any flag for overstaffing. If you would like to edit these rules, it is easy. In the Calendar sheet, select cell D7. Click on Conditional Formatting menu and choose Manage Rules. We can see the rule used. You can change the icons used for the three options (+ve number, 0, -ve number). After changing, Click OK in the dialog boxes and apply changes. How can I change the colors used in the Calendar? Click on any rule and select Edit Rule. Click on Format to change color. In the image above, I have chosen the rule that applies purple color to Holidays. After changing colors, click OK in the dialog boxes and apply changes. How to remove ‘Frozen panes’ in the Calendar sheet? 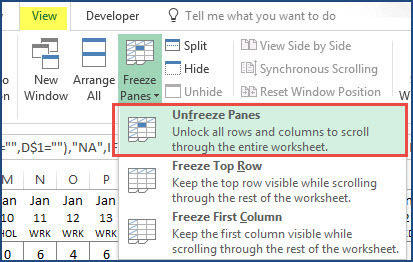 In the calendar sheet, we have applied ‘Freeze Panes’ to set columns A to C, and rows 1 to 13 always visible. If this is not preferred, you can ‘unfreeze panes’ easily. In the VIEW ribbon, choose Freeze Panes –> Unfreeze Panes. Would it be possible for You to add in the template also summary of vacation dates per emploeyee as input of the beggining of the year in order to track remaining vacation dates of the staff (per person)? Are you referring to calculating the vacation balance of each employee given an annual quota? https://indzara.com/product/small-business-paid-time-off-manager/ template does that function. I’m trying to use this with Google sheets but it doesn’t seem to be working right. It only shows one row for one employee on the first sheet, so just Employee 1. How do I add more employees? I copy the row and paste below it but it doesn’t correspond ton and populate the other sheets. Help? This template is designed to work on MS Excel. Most of the features will not work on Google Sheets. The data is entered in the table format. Can the number of days understaffed be change to percentage of employees available? In the Report, the metrics are based on days in a month. Hence calculating percentage of employees will be tricky. For example, an employee can be working one day and not on another. How can we calculate in that scenario? Can you please clarify with an example so that we can understand your request correctly? In the calendar view (availability summary), can you help to enable me show this for 2 different category of resource? Example availability summary for all mechanical engineers and an availability summary for all electrical engineers. I believe you can help with this so please assist. What you currently have is for all resources per day but I want to be able to show this for different resource category to show which resource category if mostly understaffed per day. This template is based on individual employees, rather than on the category of skills. How can I Input the periods for each employee ? Shall I repeat the same name 3 times to put the 3 vacations for the employee ? or there is another method to add 3 periods for every employee ? Yes, please enter the employee name in 3 separate rows with different vacation dates. To come back to this question, do i also have to repeat it 3times in the calendar? Please enter only in the Vacations sheet. The calendar will automatically calculate (one row for each employee). I am sorry. I don’t have a solution for that specific need. Does the template support half day durations? Sorry, it doesn’t support half day vacations.